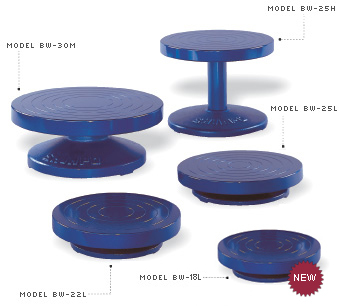 Features: 10" diameter smooth turntable, ridged steel construction, adjustable height from 24" to 36". 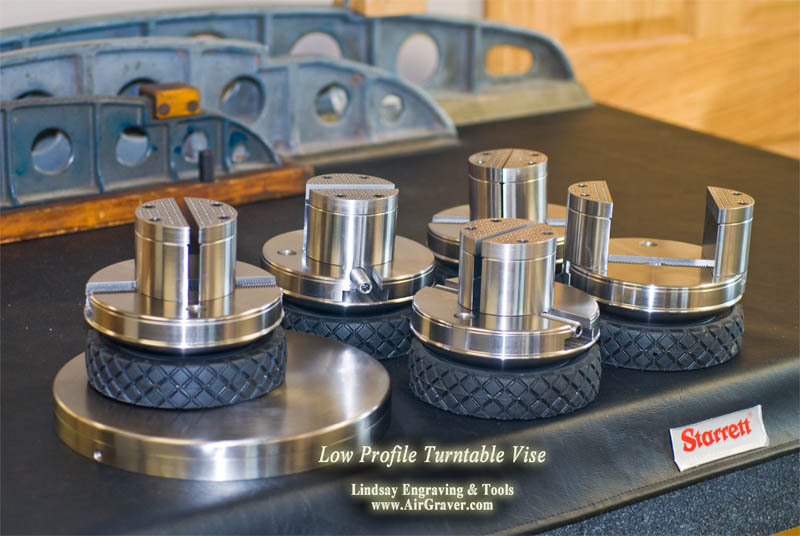 **Threaded holes in base jaws for custom fixtures and homemade jaws. **Includes pin plates, base and wrench. **Maximum jaw opening 3.375". Wider objects can be held using pin plates (5.5") or by making homemade jaws (wood, plastic, or metal) as needed and using supplied screws to hold them on. **The low profile allows tilting of the block without the viewing location moving away from the field of view in a microscope. 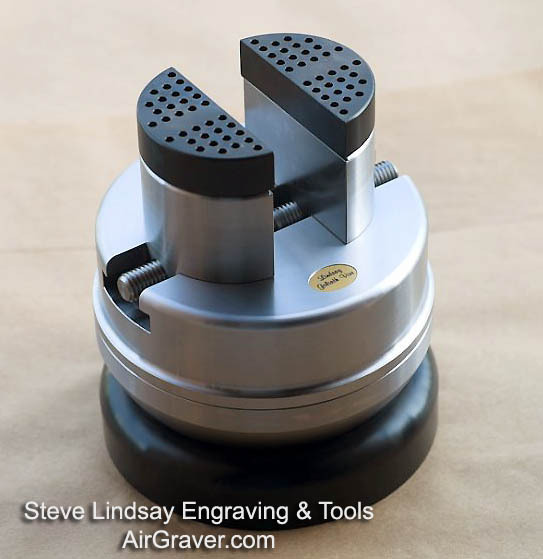 It stays centered, in a manner similar to the larger Glide-Lock vise and the Dovetail low profile vise. 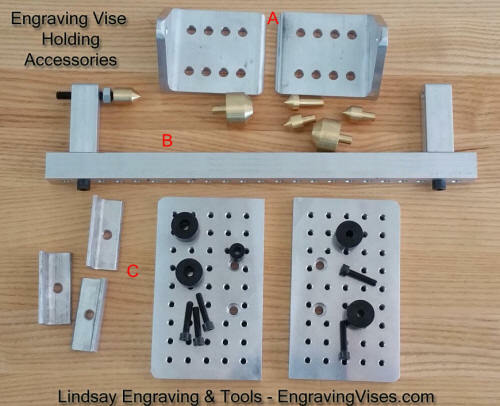 ** The vise has no bearings. It untilizes the bearings of a turntable. 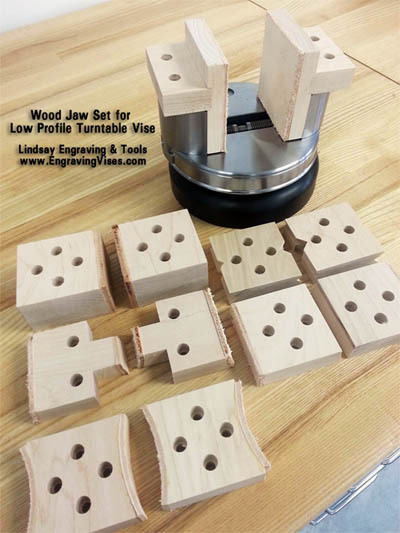 The absence of bearings in the vise allows a lower profile which provides greater rigidty. **The lower center of gravity provides stability so that the vise is less likely than a high profile vise to fall over when titled. These Maple wood various shaped soft jaws fit on the Low Profiles, later Goliaths, and Mammoth Vises. Some are leather faced. 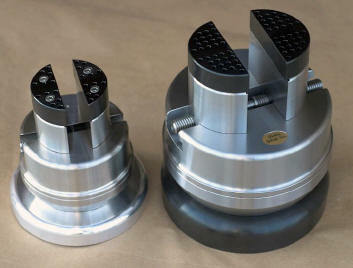 The jaws are multi-faced so that they can be rotated 180 degrees or in the case of the ones with four mounting holes rotated every 90 degrees. Six sets of jaws with 19 sets of faces. 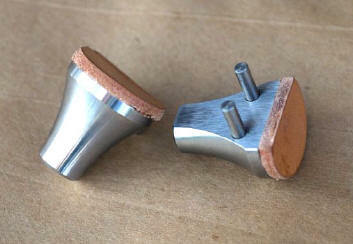 A: Adjustable centers for Low Profiles, later Goliaths, and Mammoth Vises. B: Adjustable centers for clamping in any vise. C: Universal screw plates for Low Profile, later Goliath, and Mammoth Vises. Includes nylon standoffs and screws shown. Thank Ray Cover for ideas and help making these accessories happen. 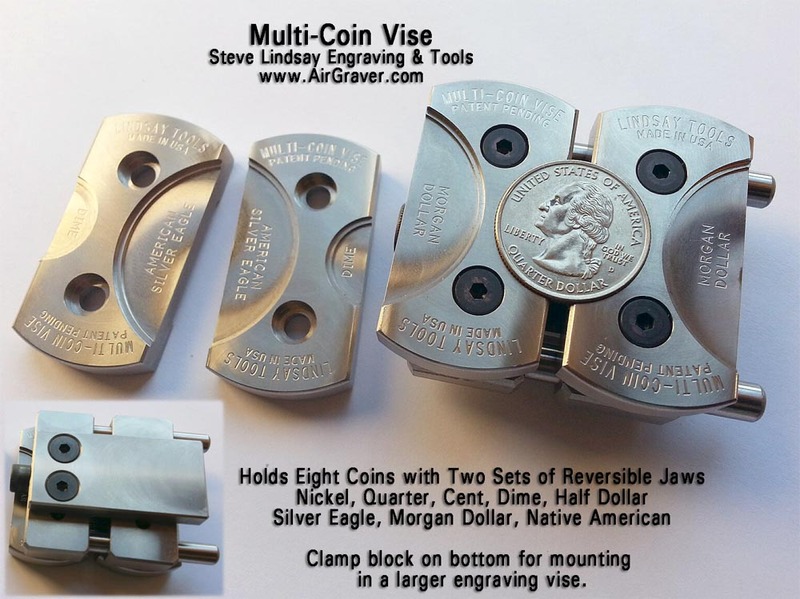 The Mulit-Coin vise holds some 61 different coins. Made with US denominations in mind, those measurements happen to accommodate a wide variety of coins from many countries. Click here for the list of 61 coins. 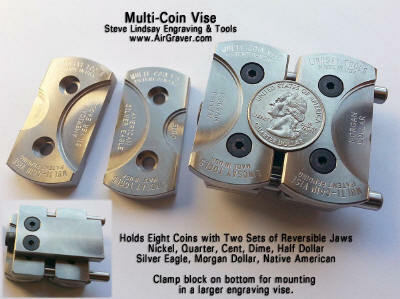 Holds Eight Coins with Two Sets of Reversible Jaws Nickel, Quarter, Cent, Dime, Half Dollar Silver Eagle, Morgan Dollar, Native American Clamp block on bottom for mounting in a larger engraving vise. 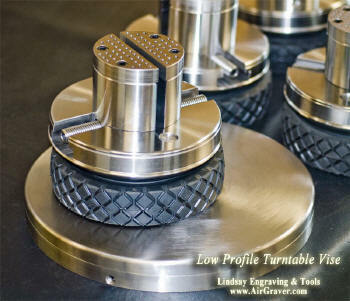 Lindsay Turntable - 10"diameter, 25lbs. Above photo of a Lindsay Turntable with a 4" PalmControl vise that is available lower down on this page. 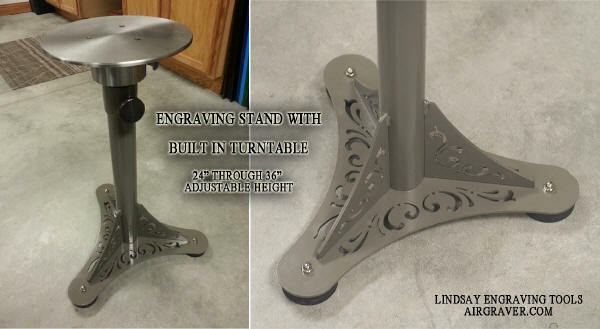 The Lindsay Turntable has been built with large ball bearings and a larger diameter race to increase stability without wobble. 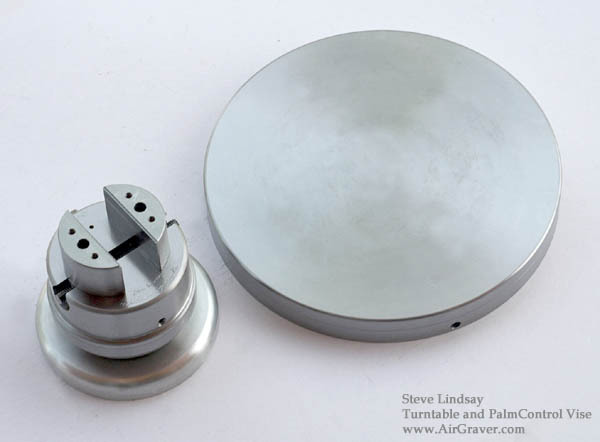 However, if at this time you cannot justify the price of my turntable, Engraver Ray Cover discovered more cost effective solution: a Shimpo turntable that can be found on pottery making craft sites. At the bottom of the page of this link, is the "Shimpo" turntables list of banding wheels. The one to get is model BW-25L. It is 9.875" in diameter x 2.25" high and at $68.88 (at the time of writing) it's hard not to recommend it for beginners or anyone with a tight budget. I noticed a little wobble in the one I tested, but it wasn't bad. Place your vise on top and approximately in the center of the turntable under your microscope. 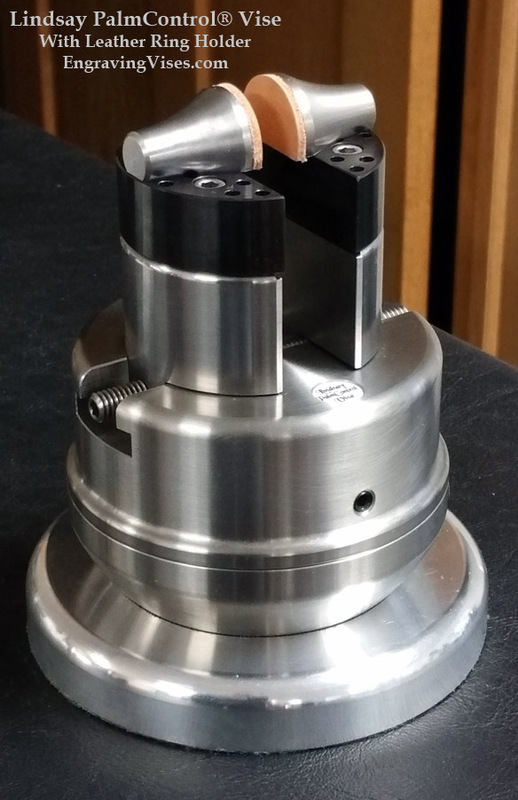 Adjust the distance/focus on your microscope until your project, or the jaws of the vise are in focus. Next, spin the turntable while looking through the microscope. To center, while spinning the turntable, look into the scope and push the whole turntable and/or your scope around until the view seen in the scope is spinning right in the middle of the field of view. From here, leave the position of the scope and postion of the turntable alone. To get to another location on the item being engraved in the field of view, simply push the vise around on top of the turntable. 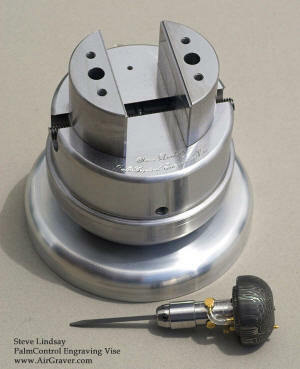 This process is the same for the Glidelock vise, even though the turntable is built into the vise. The Goliath Engraving Vise is a medium profile block, providing transition benefits between a high profile and a low profile block. **Can be tilted over farther than a low profile. **When viewing under a microscope, a medium profile designed vise allows one to tilt the block without the viewing location moving as far away as it does with a high profile. **Lower center of gravity provides stability so that the vise does not tend to fall over as easily as a high profile vise when titled. **Height from base to top of jaws 6"
Above: PalmControl vise pictured with a Goliath vise for size comparison. 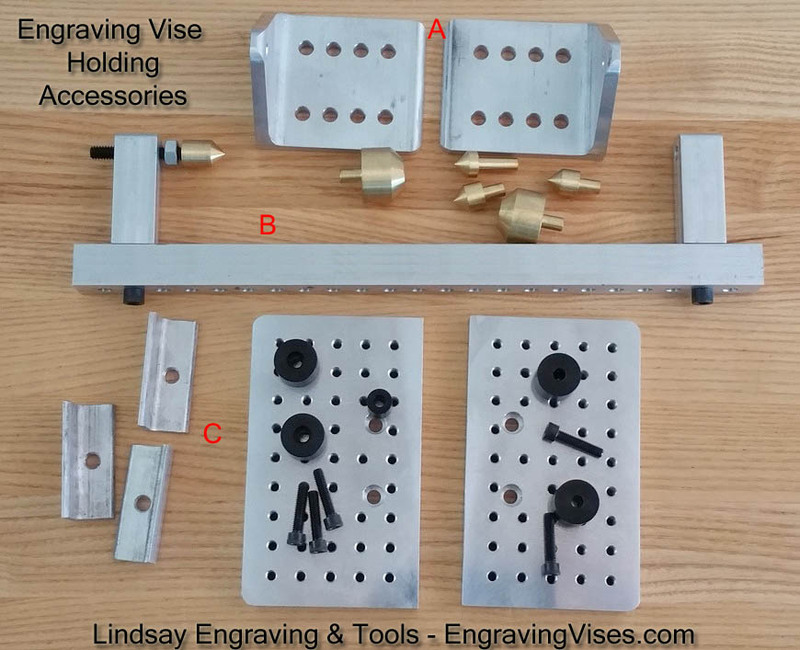 **Height from base to top of jaws (without pin plates) 4.5"
(PalmControl Vise in photo for size comparison.